Valley Oak Tool crafts the highest-quality tools for the organic farmer and backyard gardener, in Chico, California, USA. We specialize in tools to help you grow food efficiently and easily, without relying on fossil fuels. 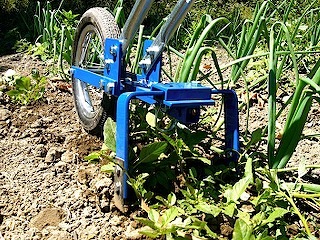 Our wheel hoes and broadforks are ergonomically designed and built to last for decades. Order From Valley Oak Tool Co. Secure Shopping Cart! "I LOVE the wheel hoe. It is the greatest tool. It ZIPS down the long rows like magic and is so easy to use. You have a great product." 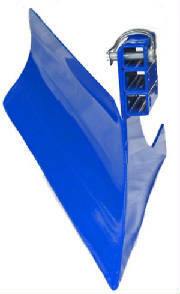 To see the wheel hoe in action, click here. Wheel hoe with the pneumatic tire option. 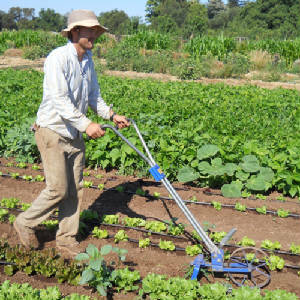 CSA worker in Chico, California, uses the wheel hoe with steel wheel option.